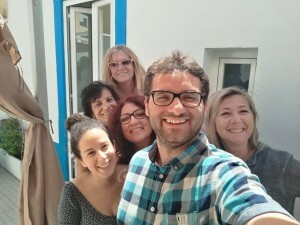 In Portugal, we hosted 6 international volunteers between April and June – 2 from Latvia, 4 from Italy and 2 from France – and we had 3 local hosting organisations Albergues Noturnos, Cozinha Popular and the Food Bank. Albergues Noturnos was one of the Senior+ hosting organisations in Portugal. It is an organisation that supports 50 homeless men between 25 and 60 years old with accommodation, meals, clothes and social support. During May and June, Saverina and Anna from Italy volunteered in Albergues Noturnos integrating its team. They reinforced the kitchen, supporting the meals preparation and distribution. By doing this volunteer experience, the volunteers had the opportunity to reflect about the reality of homeless people, challenging the stereotypes and become aware of the type of personal and social competences needed to work in this kind of social context. At the end of their volunteering experience they expressed a very high level of self-satisfaction and of positive energy that they took with them in both a personal and professional way. The Food Bank hosted 4 volunteers from Latvia and Italy and it was a very interesting experience for them to have the opportunity of learning about how is it to work in an institution like the Food Bank. They got experience about logistics and knowledge about social organisations in Portugal. The volunteers highlighted the opportunity of being included in a big organisation with a great dynamic of volunteers that everyday gave their time and energy to a cause. 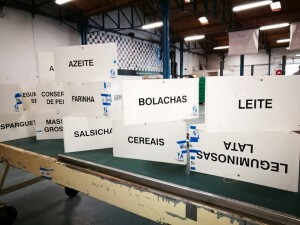 The 2 French volunteers, Muriel and Serge, volunteered in Cozinha Popular – an organisation of community development in a traditional neighbourhood of Lisbon (Mouraria) – and had the opportunity of learning about an innovative community inclusion tool, through the art of cooking. They were included in Cozinha’s team supporting the head chef, which also gave them the opportunity to develop some skills related with kitchen procedures and to know more about Portuguese and international cuisine. In general, the volunteers reported their experience of volunteering in Portugal as very gratifying and exciting, which gave them a new perspective about their personal boundaries, skills and competences that inspired them to go further with new projects. For some it meant an energy reactivation to do something more and different in their lives and for others an input of positivity and good energy to share with others. Posted in: Notizie Senior-Plus This entry was posted on Thursday, July 27th, 2017 at 3:51 pm You can follow any responses to this entry through the RSS 2.0 feed.